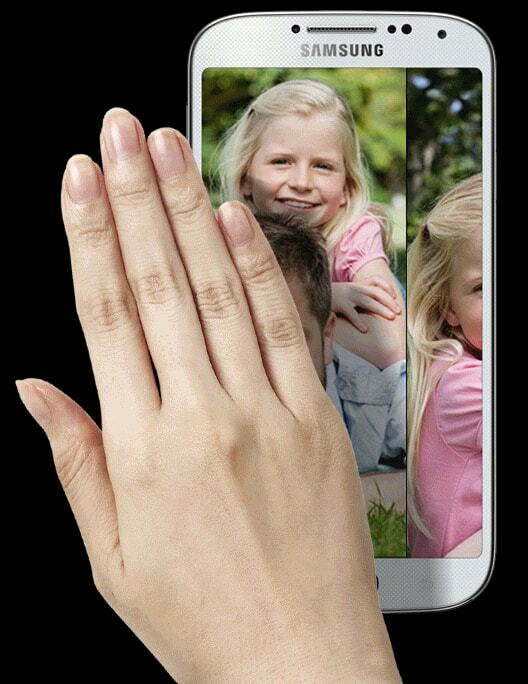 This is a very nice feature offered by Samsung Galaxy S4 as you can control your phone using only simple gestures. To access the settings of this feature, you will enter the Menu, tap Settings, My device and then Motion and Gestures. You will turn the slider button from Off to On. The sensor for Air gesture is at the top right corner above the screen. You will see a palm when Air gestures are available. You can use Quick Glance to see information for time and date, notifications, missed calls, unread messages, battery power or current music info. All you have to do is to move your hand above the sensor and the information will appear. You can select what information to be displayed. You can use Air jump to scroll through web pages and body of emails by moving your hand up or down above the sensor. Air Browse can be used to move to the previous or next item from gallery, music player, internet and more. All you have to do, is to move your hand right or left above the sensor. You can use Air move for moving icons. You will need to tap and hold the icon with one hand, and with the other hand, you will move above the sensor and place the icon where you want. Also, you can use air gestures to accept an incoming call. The Air call-accept feature will allow you to do that if you move your hand above the sensor when you receive an incoming call. The feature auto turns the Speaker On, but you can choose to deactivate it by clearing the box next to Auto Start Speakerphone.